US demand for specialty plastic additives is forecast to rise 4.5 percent annually to 4.0 billion pounds in 2017, driven by a rebound in the key construction market. Processing aids and property modifiers are expected to be the fastest growing types, while plasticizers will remain the largest segment. PVC will remain the dominant resin and will grow the fastest. 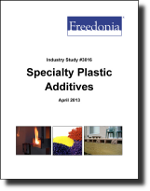 This study analyzes the 3.2 billion pound US plastic additives industry. It presents historical demand data for the years 2002, 2007 and 2012, and forecasts for 2017 and 2022 by type (e.g., plasticizers, protective additives, property modifiers, processing aids) and resin (e.g., PVC, polyethylene, polypropylene, polyurethane, polystyrene). The study also considers market environment factors, details industry structure, evaluates company market share and profiles 39 major producers, including BASF, Exxon Mobil, and Eastman Chemical.